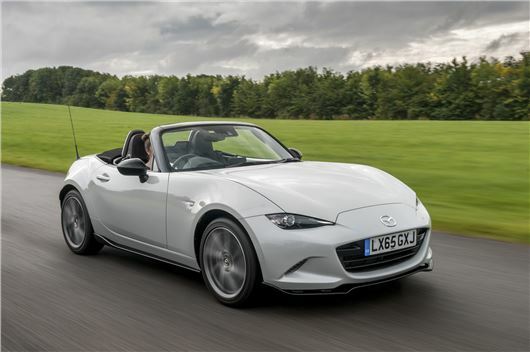 Mazda has introduced a limited edition MX-5 Sport Recaro model priced at £24,295 on the road and available to order now. Just 600 will be made. Based on the 2.0-litre 160PS Sport Nav, the Sport Recaro gets a black sports aero kit with a rear spoiler plus front, side and rear skirts. It also adds 17-inch Diamond Cut alloys and gloss black door mirrors. Inside, the standard Recaro seats have Alcantara trim on the seat cushion and seat back with red trim. The dash is similarly finished in Alcantara with red stitching which continues on the handbrake and gear lever. Like the Sport Nav it's based on, the new special edition has sports suspension with Bilstein dampers and a limited slip differential to improve traction. Standard equipment includes LED headlights, climate control, DAB with Bluetooth, navigation with a 7-inch touchscreen, a leather steering wheel, cruise control, a Bose sound system plus keyless entry and rear parking sensors.